« FREE Coffee Bean, TODAY, NOW! Ah, Black Friday. A shoppers dream. A fashionista’s haven. My favorite holiday. It’s the time of the year when all people let loose and the shopping madness officially commences to kick off the holiday season. It’s also the only day that stores open at ridiculous hours so people like me and you can snag super discounts on our favorite clothing and electronics. But, like any other event, you need to be prepared. So I’d like to offer some of my favorite tips to help you get through Black Friday. Black Friday isn’t a day to peruse the mall and seeing what you like. It’s about being aggressive and knowing what you want. Make sure you check out the ads and make a list of what item you want and where so when the big day comes, you can beeline to the exact thing you’re looking for. If it’s a great bargain, make sure you get there first before it all sells out. Just remember that there will be hundreds of other aggressive people looking for the same stuff you want, so if you can check stuff off your list, then you won’t get home forgetting the most important item! This is one shopping day when doing your homework and checking the ads in the paper can come in handy. Make sure you clip the ads and bring them to the store with you, just in case of a dispute. How unfortunate would it be if you get to the register and they deny the price that you saw in the paper? Having an ad with you is also a way to bargain with a competitive store for the lowest price. Some stores open extra extra early, like 4am. Make sure you check when they open and if they have an “early bird special.” Some places will offer an extra discount to those who make it there just a bit earlier than everyone else. Plus you’re guaranteed to get the best of the best, instead of showing up late to a picked over bargain bin. Yes we all know that with these super low prices, we do tend to make often brash and quick purchases, only to get home realizing that we didn’t need it. Make sure that you check the store policy and see if you can return it or if you’ll get store credit or not. This will allow you to shop more freely without facing consequences later when you realized that you’re didn’t really want that $600 sweater that was on sale for $300. Just like going to gym (ok, maybe not quite as painful), getting up at 5AM to go shopping is a bit crazy. But if you’ve got a great shopping buddy to help you decide if it’s a good buy or not and give you advice, it will make your day a hell of a lot easier, and more enjoyable. Maybe she or he will even carry some of your bags for you! Just make sure you pick a buddy that has similar taste in clothing as you, or a very dedicated boyfriend! Many times, the night before Black Friday, stores offer a sneak peak on clothing the night before at comparable or better prices. Check out the site and see if you can’t skip Black Friday altogether and get a better deal online. Plus, you’ll get it delivered right to your door! Also, most places offer free shipping on holidays like these, so take advantage of these savings. If you’ve committed yourself to Black Friday, make sure you wake up and have a big cup of coffee or green tea to help jump start your day. 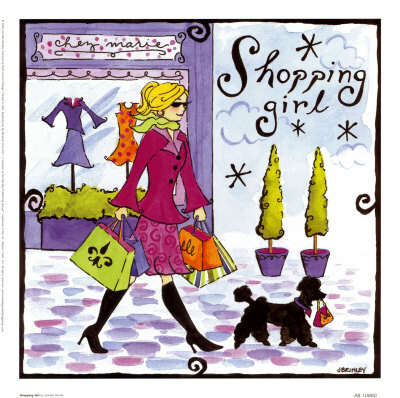 You’ll be more alert and ready to make some great shopping purchases. Plus, no one wants to shop with a Zombie! This entry was posted on	November 18, 2009 at 3:48 pm	and is filed under Events, Fashion News.